Chief Seattle's oldest daughter was named Kikisoblu. She became friends with many of Seattle's founding families. One of her friends was Catherine Maynard. She felt that Kikisoblu should have a name that would let the white settlers know that she was the daughter of a great chief. So she called her Princess Angeline. She thought that name was prettier than the name Kikisoblu. Angeline lived in a small shack on the downtown waterfront. Her new friends wanted to help make her life more comfortable, but Angeline wanted to take care of herself. She washed their laundry so that she could earn her own living. She also sold handmade baskets from her home. There were very few official birth records for early native people but historians have estimated that Angeline was born around 1828. Photographers liked to take pictures of her. They wanted the world to see what the Native Americans from this part of the United States looked like, and she was the daughter of the chief for whom the city of Seattle was named. She was almost always shown wearing a red bandana, shawl, and several layers of clothing. Her image has been used on souvenirs and postcards for more than 100 years. The portrait of a Native American that the famous Northwest Photographer, Edward Curtis, took in his studio was of Princess Angeline. When Angeline died in 1896, she was buried in Lake View Cemetery next to her friend, pioneer Henry Yesler. Her coffin was built in the shape of a canoe. After many years had passed, Seattle school children raised money for a special stone for her grave marker. There is a plaque attached to the stone that describes Angeline and her friendship with the early settlers to this region. 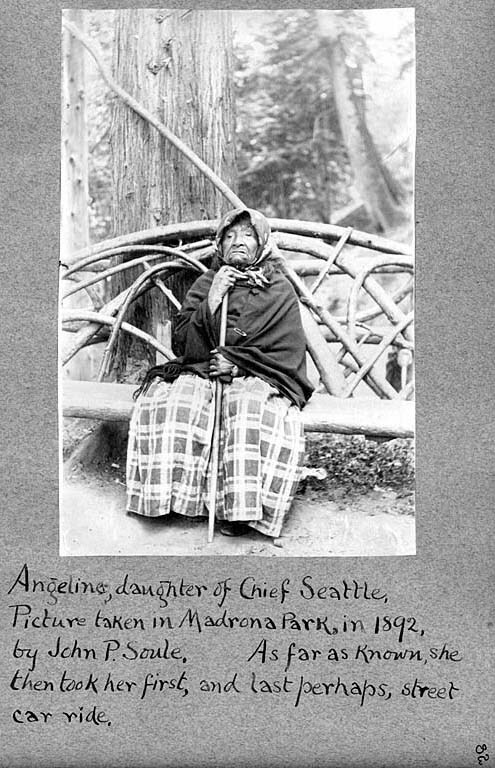 This essay is based on the following HistoryLink essays: "Princess Angeline or Kikisoblu, daughter of Chief Seattle dies on May 31, 1896" (Essay 2493) and "Curtis, Edward S. (1868-1952), Photographer" (Essay 8857). It is one of a suite of essays (called HistoryLink Elementary) that focus on important people, places, and events in Washington State History, and that align with elementary school textbooks and state academic standards. All the HistoryLink Elementary essays are included in the HistoryLink People's Histories library, and the HistoryLink Elementary suite and related curricular activities can also be found on HistoryLink's Education Page (http://www.historylink.org/Index.cfm?DisplayPage=education/index.cfm). The HistoryLink Elementary project is supported in part by Heritage 4Culture's Special Projects Program.